We are finally rounding up the March Wash Day Experience Themes. I slacked a bit and only did 2 out of 5. This week is all about smooth and sleek curls. Normally, my go-to method for smooth and sleek curls is a roller set with magnetic rollers. However, being 11 months post relaxer, I didn’t think that magnetic rollers were going to do the trick for my new growth. KLP has been sharing her love for curlformers lately. I decided to try some of her tips for a great set. I needed to infuse some protein into my strands. Lately, breakage and I are 5 and 6 and I don’t really want to be that familiar. Usually, I clarify before I use protein to start with a clean slate. This wash day, I wanted to try using bentonite clay. It’s KLP to the rescue again with her mud wash recipe which I modified it a bit. Here’s how it went down. (1) Pre-poo and Detangling: I sectioned my hair and finger detangled each section. Then, I applied my Creme of Nature Argan Oil Intensive Conditioning Treatment and coconut oil, covered my hair with cling film, and wrapped my head with a towel. I kept this on for about 2 hours. I detangled with my seamless comb to make sure that most of the shed hair was gone. (2) Shampoo and Mud Wash: For the mud wash, I used bentonite clay, apple cider vinegar, aloe vera gel, olive oil, and water. I mixed the mud wash like KLP suggested. I rinsed out the pre-poo and shampooed once with Creme of Nature Argan Oil Shampoo. After I rinsed the shampoo out, I applied the mud wash and kept it on my hair for a few minutes. When I rinsed it out, my hair felt soft and a bit oily. It didn’t have the feeling of being clarified. I think adding olive oil to the mixture was a mistake. I washed my hair again with my ORS Neutralizing shampoo and it felt a bit better. I was able to see my curl pattern a little better immediately after the mud wash. However, this didn’t last too long. It looked the same as if I washed it with shampoo. (3) Deep Conditioning: After towel drying for a few minutes, I applied ORS Hair Mayonnaise to each section and sat under my steamer. The steaming session lasted about 20 minutes. I rinsed my hair with warm water and used cold water from the shower for the final rinse. I forgot to put the water in the refrigerator for my super cold but useful final rinse. 🙁 After rinsing, I dried my hair with a t-shirt for 15 minutes. (4) Leave-ins and styling: Since I wanted my curls light and smooth, I decided to limit the number of leave-ins I use. I chose to use Aphogee Keratin and Green Tea Restructurizer because I planned to use heat to dry my hair and it doesn’t have humectants in the first 5 ingredients. I wanted to minimize frizz as much as possible. I also used OGX Nourishing Coconut Milk Anti-Breakage Serum. This breakage thing is no joke. Following many of KLP’s tips, I installed the curlformers and set them with water. My hair was pretty wet. I remember getting the best roller sets when my hair was soaking wet. I also detangled each section with my Denman brush. I did not heed her advice on sectioning and I ran out of curlformers and had to use flexi-rods. To dry, I dusted off my hooded dryer (literally :shock:) and used it on medium heat for an hour. It was pretty late by that point and I went to sleep. The next morning, I woke up to a rainy day. That did not bode well for my curls and they frizzed almost immediately. Rain, rain. Go away. ? I got a pretty decent up-do out of it. Later that day, I played tennis and it was essentially a wrap for the curls. Over and done with. Can we please get a round of applause for that curly updo?!?!?!?! Your curls look amazing chica! So smooth and shiny despite the rain! Congrats on getting your hair balanced again and super moisturized! Do you think that you will try curlformers again? Thanks, KLP. I think I will try curlformers again. I just wish I had a better holding product. You have curlformers nailed Uzo. I love your curls. I miss curly hairstyles – my hair is too short for them currently. Thanks, Lungi. Your hair will grow back sooner than you think. 🙂 Is it long enough for bantu knots? 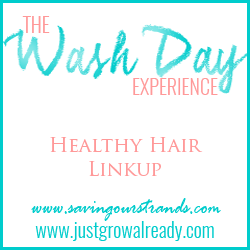 Loved how you explained your wash day process and the end result! GIIIIIIIIIIRL! your curls are looking GORG!!!! Such a great way of stretching out hair. I’ll probably try it one day! Nice. I hope you post your results. P.S. Where did you get your curlformers? Thanks, AB. I got the curlformers from Sizzelle. Oh wow those curls!!! I am so intrigued to try the mud wash, the list of things to try is getting longer. Your new growth is giving me life, are you transitioning or on a long stretch?